Experience shows us just how true is the old adage which states that “the one who does not renew himself will wither away”. By his very nature, man seeks to renew himself and that which is around him. Life is a process whereby we move from one phase to another. At the same time, man is also capable of resisting change. He is capable of putting spokes into the wheel of change, choosing to remain entrenched very firmly in the past. This is because sometimes change comes at a price. But it seems the Archbishop isn't in favour of all change. 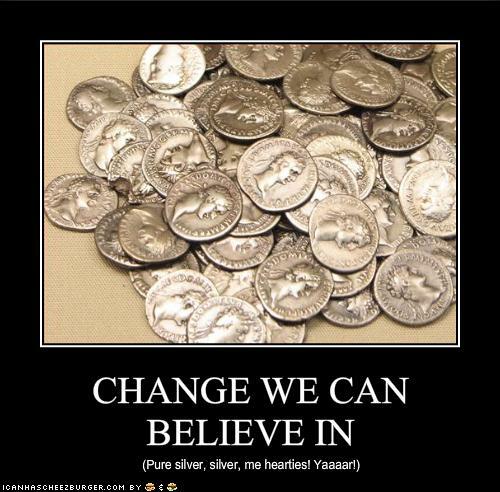 On the contrary, he has a positive idea of what kind of changes are needed. And funnily enough, these are exactly the changes which were made forty years ago. Because it seems those changes weren't entirely complete. Yet since some seed has fallen onto dry land or among thorns, so the desired fruit might have not all been reaped. 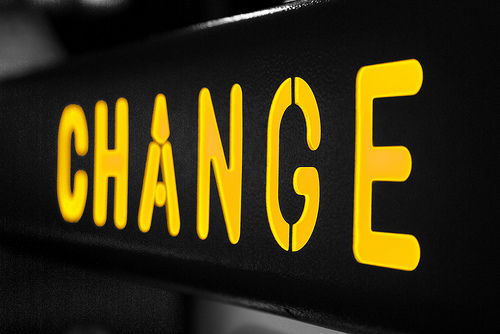 So the change we really need to undergo is to go back to those old changes and do them all over again - or to do them some more - or embrace them more fully - or something. shift from our present standpoint and move forward, rather than simply going around in circles. Therefore, unless we are vigilant, as a Church we too run the risk of running dry, our liturgy becomes theatrical, the Church is rendered no more than a historical museum. This pastoral letter could have been written by any number of bishops. It encapsulates the generational misunderstanding which is gripping the Church. 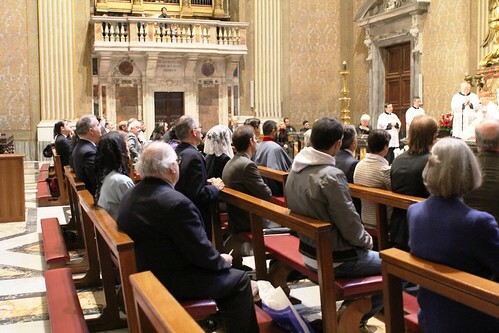 Those whose went through the 'Post Conciliar Renewal' with enthusiasm know exactly what is 'old' and what is 'new': the old Mass is old, the fearless preaching of the Gospel is old; the new Mass is new, ecumenism, lay participation and all the rest is new. If anyone suggests having the EF this is obviously a case of someone wanting something old, of rolling back the renewal, or undoing change. And of course in a sense it is. 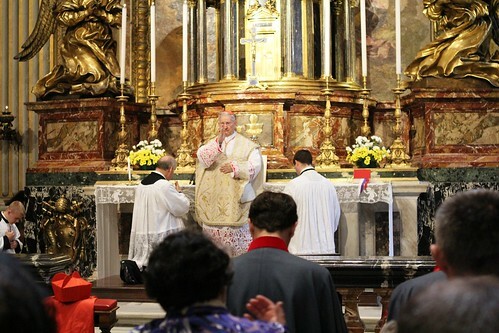 But for anyone younger than fifty, the new Mass is old. Eucharistic ministers, lay readers, ecumenical gatherings and all the rest are not new and exciting, they are part of the familiar and faded pattern of church life. When we discover that they were only instituted a generation ago, that doesn't fill us with enthusiasm; it just makes us realise that their roots are not deep, they don't derive from the timeless wisdom of the Church: if they aren't working, we should try something else. 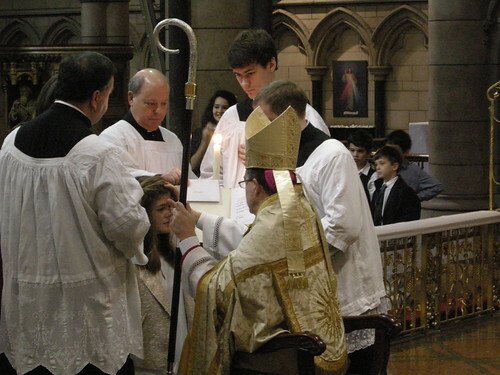 The Old Mass is new, having a sense of the sacred in church is new, insisting on a separation of roles between priest and faithful is new, liberating, refreshing; the fearless preaching of the Gospel, without an exaggerated tact toward our 'separated brethren', is a breath of fresh air. The talk of change change change which accompanies a deep hostility to changing anything, the exhortations to renewal which accompany the insistence that the theology, hymns, vestments and parish structures of the 1970s be preserved in amber for all time... these just strike us as absurd. Can't you read the signs of the times, friends? The other day Diane Taylor, Secretary of Ecclesia Dei New Zealand (the New Zealand affiliate of the Una Voce Federation), visited Oxford; we had lunch together. 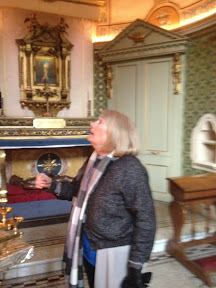 Here she is looking at the relics in the Relic Chapel of the Oxford Oratory. 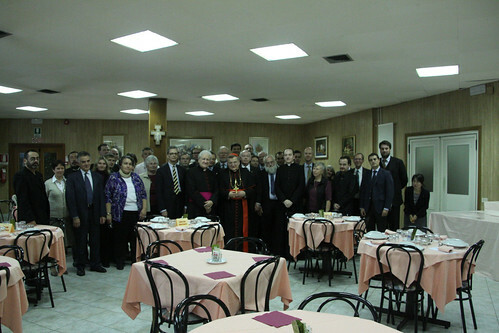 It's pretty unusual to be visited by members of the Una Voce Federation from the other side of the earth, but having come to Rome for the Federation meeting Mrs Taylor decided to make the most of it. In the capital, Aukland, New Zealand has had for some time a church dedicated to the Traditional Mass, served by a priest who looks after a regular congregation drawn from far and wide. 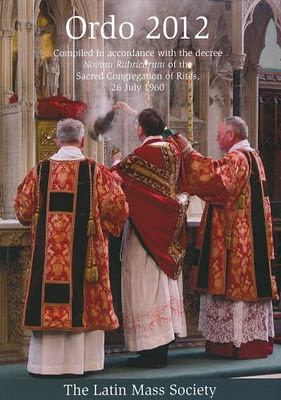 This is an important precedent for the developing situation in England: a church shared between a parish and the Fraternity of St Peter in Reading, an official 'Chaplaincy' of the Fraternity in the Diocese of Northhampton, and the agreement between the Bishop of Shrewsbury and the Institute of Christ the King which gives them the use of the Church of SS Peter & Paul in the outskirts of Liverpool. The Sons of the Most Holy Redeemer, who are based at their monastery of Golgotha on the island of Papa Stronsay in the Orkneys, have documentation on their blog which appears to show that they have been deprived of a share of a legacy by the Society of St Pius X. The Sons have received the £2,000 for Mass stipends, but not the rest. A strange story. I am very happy to put this statement from Fr Paul Morgan, Superior of the SSPX in Great Britain, before a wider audience. buy their annual Wall Calendar! Yes the LMS does one too, so buy that as well! One for your kitchen, one for the sitting room - obviously! And buy a few more to give your friends for Christmas! A series of possibly linked facts has become evident. They may, or may not, be of interest to readers. The Journal Usus Antiquior is now edited by Ben Whitworth. (Recall the launch.) 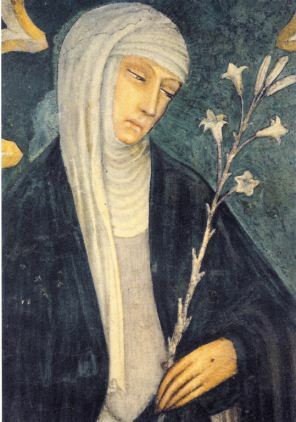 It is no longer linked to the Society of St Catherine of Siena (though see the Facebook page). 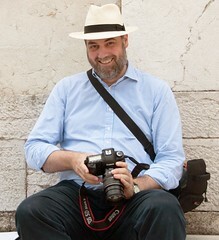 Dr Laurence Hemming no longer describes himself as a Deacon of the Catholic Church on his website. I don't know what to make of all this; the full facts are not available to me. I don't think it is terribly important. It is a side issue. The small number of dedicated Christian Order readers who manage to wade through through the first 26 pages of the latest edition will find a few paragraphs attacking me by name, on page 27 and the top of 28, for my blog post about the fiasco of the cancelled conference organised by Pro Ecclesia et Pontifice. I hesitate to give this any publicity but I think it is worth making a few remarks about it. As Editor of Christian Order Rod Pead has long treated it as a personal mouthpiece, but recent issues have taken this principle to new extremes. The current issue comprises entirely, with the exception of a letter to the editor printed on the inside covers, the Editorial. Christian Order has a small format, but that is 79 pages of text (there are no pictures), not counting the contents page. This is not an unprecedented situation, and this is in fact just Part III of an apparently endless rant about the Jews. I doubt any sane person will have the time or inclination to sit down and untangle the various theological and political claims being made by Rod Pead in these articles, to establish whether he can fairly be accused of anti-semitism. What a glance at the contents page tells us, however, without further ado, is that he is in the grip of an obsession. The style is prolix and undisciplined; he's just rabbitting on like a pub bore on speed. If there were a serious point at the bottom of all this verbiage, a serious person would realise that these CO articles are counter-productive in getting it across. "I don't know much about Kramer and Sungenis, but I know they are widely regarded as dangerous lunatics, and with justification." I'd be happy to withdraw the 'with justification', on the basis that it is for their accusers to make the case, which of course they are happy to do. My point is simply that there is a perception of them being extremists, and that this perception is based on enough evidence (justification) that it is not going to be undone in a trice by a couple of adverts in the Catholic Herald. Given what had just happened - the withdrawal of Cardinal Burke as a speaker on the grounds that PEEP was a cause for concern to faithful Catholics (ie, a bit extreme), inviting two alternative speakers who are regarded as more than a bit extreme was not a very clever idea. Rod Pead's accusation against me is that this remark of mine is an unjustified slur on the good names of Kramer and Sungenis: no, it's not, it is merely a comment about public perceptions of them; my lack of knowledge about them in themselves is made explicit. He also says that this remark indicates that I am a 'useful idiot' in going along with the great conspiracy of Jews, Communists, Freemasons, and promoters of theological innovation, yawn yawn. 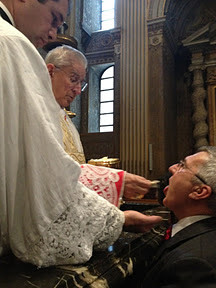 Well, I have news for Rod Pead: insofar as there are problems in the Church, insofar as error needs to be opposed, and our great liturgical traditions made available once more to all Catholics, as our Holy Father Pope Benedict XVI now gloriously reigning wills, the Latin Mass Society is doing a great deal more about it than Christian Order. Not even the Catholic Herald seemed aware that the Bishops were using the prayer which was said at the end of the principal Mass on a Sunday in every parish in England and Wales until 1964. The translation is not the same as that found in my Baronius Press missal but it is clearly the same prayer. I'm delighted to see this being restored, at least for one Sunday. 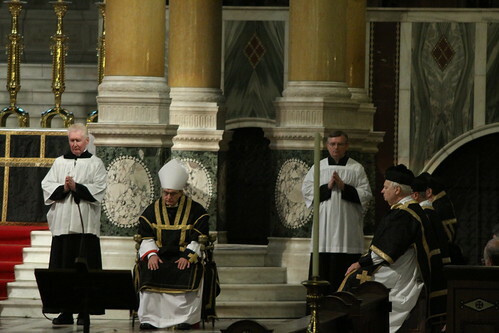 I'm not sure why it 'is used after the post-Communion prayer and before the final blessing', instead of right at the end of Mass; perhaps the Bishops are worried that, not being used to it, the people would start leaving church before the prayer was said. In 1964, so I understand (I hadn't been born) the Bishops of England and Wales announced that the Domine salvam fac would no longer be said, but a prayer for the Queen should be included among the Bidding Prayers. I think I have heard this happen, but I'd say it was pretty rare. What actually happened in most places is that prayers for the good estate of the Queen were just forgotten. My country right or wrong! If right to be kept right! If wrong to be set right! I don't know when Catholics started to pray the Domine salvum /salvam fac for the monarch, but a friend of mine has found it in a Missal printed in 1815. Message to the Daily Mail: we've been doing this for a long while! 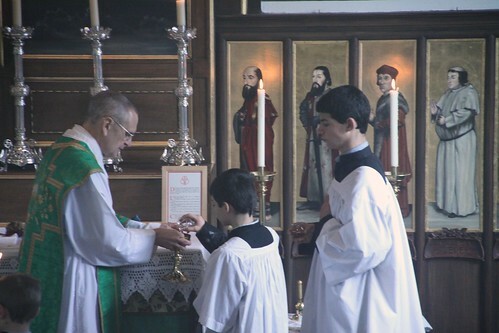 On Sunday Fr John Saward celebrated a Missa Cantata at 12 noon in SS Gregory and Augustine's in the Woodstock Road. 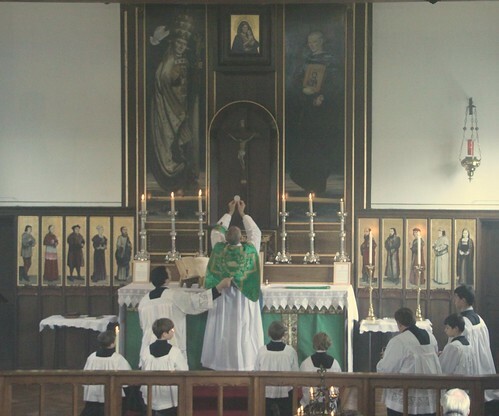 Although we are blessed with many traditional Masses in and around Oxford, a Sung Mass on a Sunday is rare, and Fr Saward is now celebrating one each month. 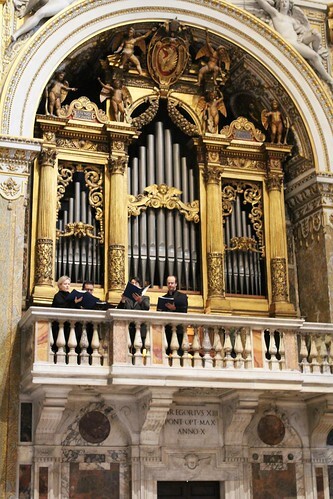 The Mass was accompanied by the Schola Abelis, with polyphony: Cristobal de Morales's five-part Missa L'Homme Armee (the Armed Man). The next one will be on the Fourth Sunday of Advent, 18th December, again at 12 noon. 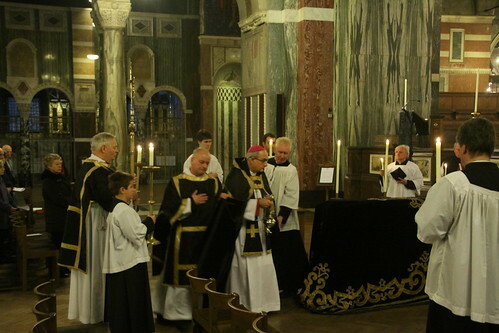 Yesterday was the LMS' Annual Requiem for our deceased members, a Pontifical Mass in Westminster Cathedral celebrated by Bishop Alan Hopes. 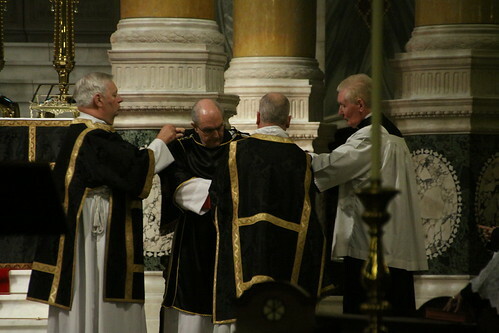 Fr Andrew Southwell, the LMS Chaplain, was assistant priest; Fr Tim Finigan was Deacon, Fr David Irwin Subdeacon. Before Mass, we had our customary prayers for Cardinal Heenan. 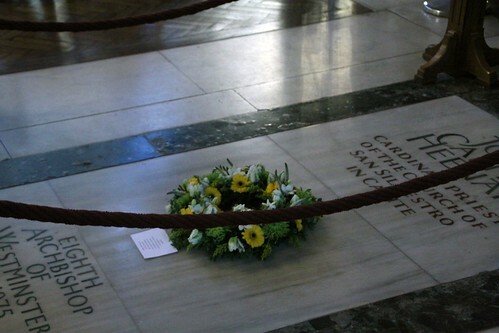 I laid a wreath on his tomb in the Cathedral; the prayers were led by Fr Patrick Haywood. The current issue of the Mass of Ages has a feature on the 'Heenan Indult', which the Cardinal personally requested (at the request of the Latin Mass Society) from Pope Paul VI, in 1971, forty years ago this year. The importance of this, the first official permission for the Traditional Mass for the good of the faithful, is difficult to overstate. The permission was extended to the whole world only in 1984. Bishop Hopes on the faldstool. 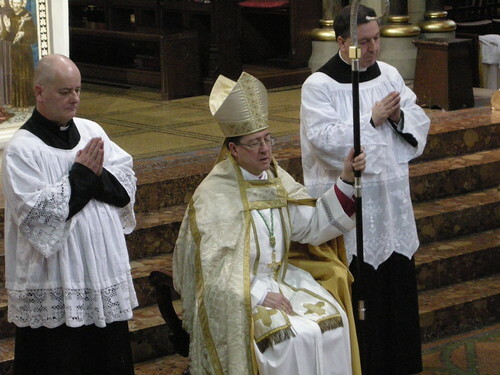 Bishop Hopes wore a dalmatic and tunicle under his chasuble, as bishops do. 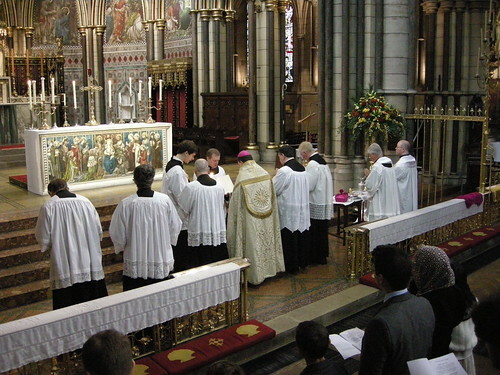 He took them all off, a put on a cope, to preach (at the end of Mass, not after the Gospel, again a custom of Requiems) and to bless the catafalque. As is now customary, there was a catafalque, which Bishop Hopes blessed. These photos aren't as good as usual since I don't have access to my usual processing software. It is very noticable how dependant I am on the magic of Photoshop when taking long-distance photos in dim lighting - and without a flash. Normal service, I hope, will be resumed shortly. The rest of my photo set is here. In my post about early morning Masses in St Peter's, I included a photo of one of the chapel murals: an intriguing but obscure scene. I've now been told (by our Rep for Clifton, no less!) what it depicts. Here's the picture. The thing I missed completely when I posted it was that the fellow about to commit suicide is clutching a key. This wouldn't have helped me all that much but it seems his demonic possession and suicide in front of a king is the punishment for his sacrilege in attempting to steal the key which decorated St Peter's tomb. I am told: "The fresco is to be found in the Chapel of the Madonna of Partorienti. It was painted by Giovan Ricci da Novara, between 1618 and 1619. 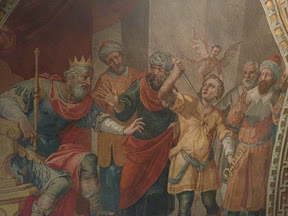 The panel is one of several by da Novara, and represents 'The Longobard and the Key of St Peter', which is an episode narrated by Gregory the Great. The Longobard is the man committing suicide. He tried to break the golden key from St Peter's tomb and then, taken over by an evil spirit, he slit his own throat. The enthroned king is Autari, the king of the (Arian) Lombards, who repairs the damage done to St Peter's tomb. " 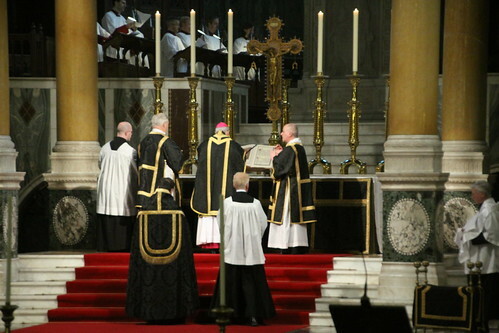 Rt Rev John Sherrington, newly installed auxiliary bishop of Westminster conferred Confirmations in the Traditional Rite on 31 candidates at a ceremony organised by the Latin Mass Society (LMS) at St James’s, Spanish Place in central London on Saturday, 12 November.Originally, Bishop Alan Hopes of Westminster was intending to confer the Sacrament but had to withdraw at the very last moment owing to ill health. Bishop Sherrington stepped into the breach at less than 24 hours’ notice to ensure a very successful and happy event went ahead as scheduled. 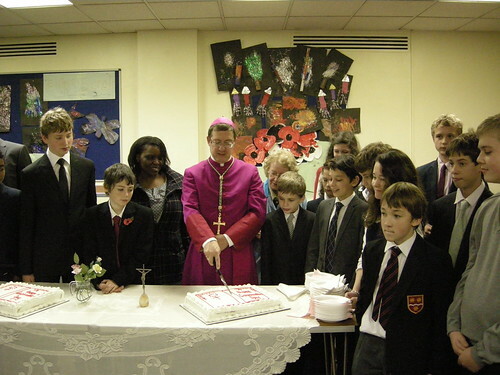 He was assisted by Fr Andrew Southwell, the LMS National Chaplain, Fr Tim Finigan and the rector of St James’s, Fr Christopher Colven.After celebrating Pontifical Benediction of the Blessed Sacrament the bishop joined candidates and their families and friends in the Parish Social Centre for a buffet lunch where he also cut one of two celebratory cakes. 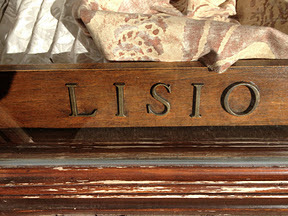 See more on Fr Tim Finigan's blog; see the full set of LMS photos. I'm not in a position to process my photos yet, annoyingly, but here are a couple I took: of Cardinal Castrillón Hoyos celebrating Mass in the Blessed Sacrament Chapel in St Peter's, and of the conference participants with Cardinal Raymond Burke. Here are some photos taken by the Wandering Oblate. Choir singing at our Mass in the Blessed Sacrament Chapel; they are in fact the regular singers at Sta Trinita, the FSSP church. The congregation: the chapel was pretty full. 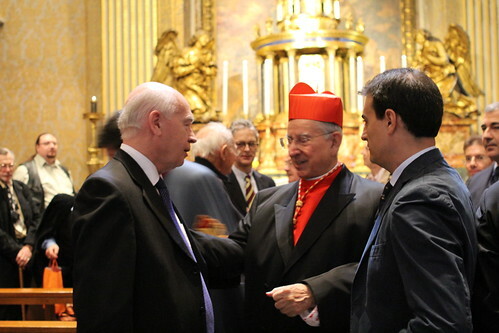 Cardinal Castrillon after Mass with Leo Darroch, FIUV President. My set here for Cardinal Hoyos' Mass; here for the Conference. 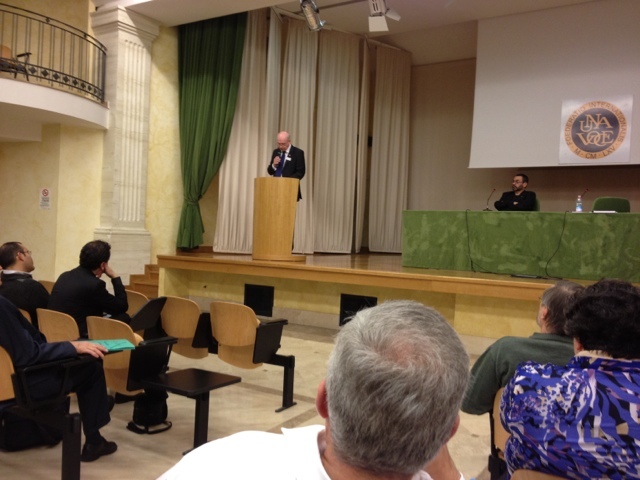 The Wandering Oblate's set of photos; blog - I think he'll be posting on the conference soon. 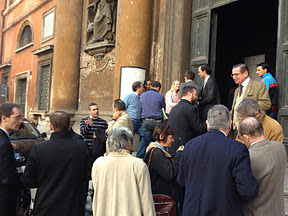 I have been hearing about the early Masses in St Peter's and this morning I got up early to see them. 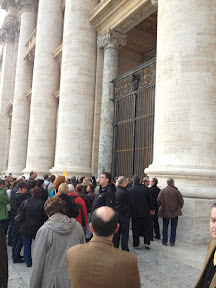 If you get to the front of St Peter's before 7am, you see the great iron gates swing back and you (and, at least today, a crowd of others) can swarm in. 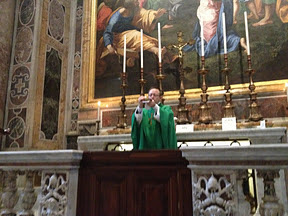 In the following minutes priests start pouring out of the sacristy to say private Masses at side altars. 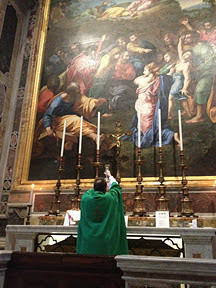 Some go into the crypt, some to the altars of the upper basilica; some are saying Masses for groups of visitors, some are simply saying a private Mass. There were priests saying Masses in various languages, some for quite large congregations, singing; others were saying the Traditional Mass. We followed one group into the crypt, which I have never seen before. It is an odd mixture of beautiful old chapels and ... modern ones. I'd be interested to know what this fresco, in the crypt, depicts; it appears to show someone threatening suicide surrounded by people in turbans, with the eager encouragement of a devil. I have no idea who the celebrant was, but he ended up with a congregation of four. Sadly, neither he nor the other priest celebrating the EF had a server; if I'd been there when he arrived, I would have volunteered myself. 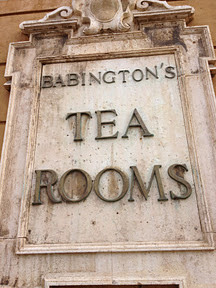 Flushed with our success we then had breakfast at the maddest restaurant in Rome: Babingtons, to be found for more than a century at the foot of the Spanish Steps, which serves English food. Yup, scones and clotted cream, 'Full English Breakfast', a wide range of teas... I had an extremely good Eggs Benedict, in honour of the Holy Father. I did, however, resist the temptation to photograph it. 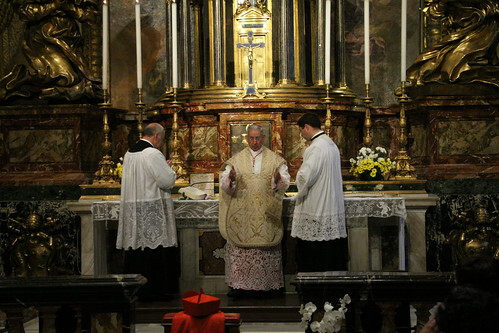 regular Sunday Solemn Mass. I was delighted to see not only Fr Kramer FSSP, the Parish Priest, but also Fr William Barker FSSP, whom I saw ordained in Wigratzbad only two years ago. He is Fr Kramer's deputy. 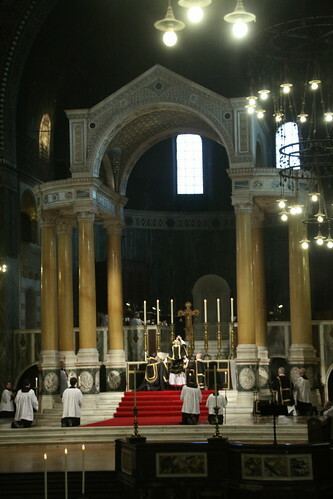 I was in fact back there in the evening to attend Mass with my wife Lucy who had just arrived, and that (Low) Mass was celebrated by Fr Barker himself. 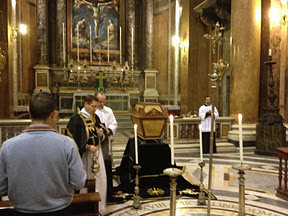 At the end of Mass he blessed a beautiful catafalque (with the Libera nos and the full cermony, as at the end of a Requiem), a custom they have for the first 8 days of November. It was very noticable to me how numbers have increased since two years ago. 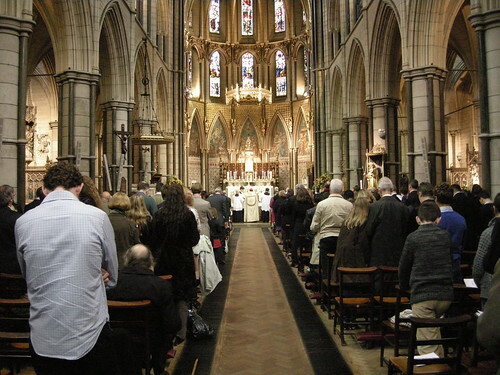 In 2009 the 10.30 Solemn Mass was well attended, but this time the church was full. There was a free place here and there but you had to look for them, and there were people standing at the back. 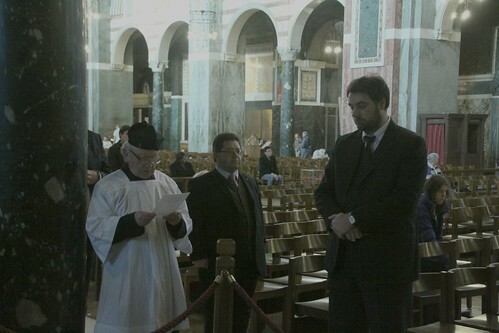 This is a great testimony to the hard work of Fr Kramer, and the excellence of the liturgy, and very good polyphonic choir. 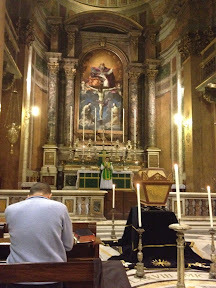 In addition it should be noted that, as I was told by another priest, there are now no fewer than eight places where the faithful can attend the Traditional Mass in central Rome on a Sunday - not counting the SSPX. 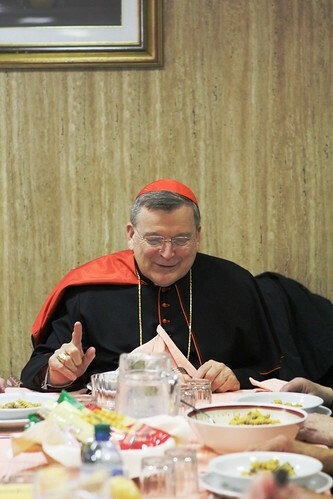 After Mass yesterday we were joined for lunch by Cardinal Raymond Burke. We then had the 'Private' part of the conference, at which Leo Darroch was re-elected as President, and Monika Rheinschmitt (from Germany) as Treasurer. We have a new Secretary, Thomas Murphy, from Ireland. The Council was elected unopposed (the number of nominations exactly matched the number of places available), including me, and the head of the new group formed in the Philippines, Carlos Palad. This was not the most photogenic part of the conference, but it is an important one. We have accepted 17 new Associations into the Federation since the last meeting two years ago, bringing the total to 45, an astonishing rate of growth; it is of immense benefit to the new members to have the moral and practical support of the more establishes groups and of the Federation as a whole. FIUV has never been more active or useful. 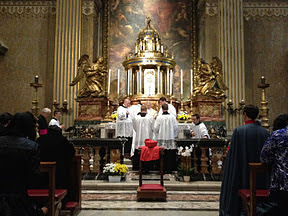 Voce International confernce, we had a Mass celebrated by Cardinal Hoyos in the Blessed Sacrament Chapel of St Peter's. Actually it came out when I was recently away but I thought it would be good to advertise the fact here. 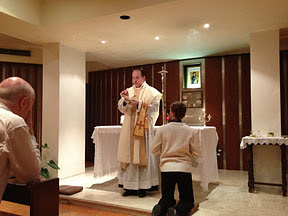 The Ordo tells you what Mass can or should be celebrated each day of the year: so how movable feasts and Sundays interact with non-movable ones, what class each feast is and so on. It is essential for any priest wanting to say the Traditional Mass, and extremely useful for singers, servers, and anyone else wanting to know what to expect! It costs £7.90 incl postage and you can buy it here. My letter in The Tablet about the alleged vulgarity of the Roman Canon talking about the 'precious chalice' stimulated a predictable mail-bag for their letters page, and they published one response in the mag and another in their 'Letters Extra' page on their website. The appearance of two letters attacking me by name does not seem to justify their publishing a response from me, however, so I'll give the letter I immediately sent them in full below. First, the letters from the enraged, but clearly terribly confused, liberals. The repetition of the same old point, that New Testament doesn't use the phrase 'precious chalice', unlike the Roman Canon, never seems to stimulate the obvious question: are we talking about a translation of the New Testament, or a translation of the Roman Canon? Perhaps the chairman of the Latin Mass Society, Joseph Shaw (Letters, 8 October), might go back to the Bible to find the authentic version of what Jesus himself said and did at the Last Supper? All our English translations of the Greek/Aramaic synoptic gospels and St Paul’s first letter to the Corinthians refer to “the cup” in their accounts of the institu- tion of the Eucharist. 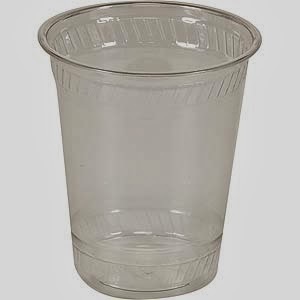 There was no “precious chalice” at the Passover meal in the upper room, despite the use of “hanc praeclarum calicem” in the fifth century, Latin adaptation of the original texts. Wasn’t one of the aims of the new translation of the Mass to bring us closer to biblical sources? Note the glorious fantasy of the Aramaic Gospels. This version only exists today in the fevered imaginations of biblical critics, and probably never existed anywhere else. What weight does an imaginary text have in this debate? Does the Church teach that imaginary documents are inspired by the Holy Spirit? Joseph Shaw (Letters, 8 October) is right: "he took the cup" is not an accurate translation of the words accipens et hunc praeclarum calicem in the Roman Canon. But it is an accurate translation of labon to poterion, (literally, "getting the drinking-cup") which is what we read in Matthew (26:27) and Mark's (14:23) accounts of the institution of the Eucharist. Luke (22:20) and Paul (1 Corinthians 11:25) use the same word, poterion, which means "cup". There is no suggestion that there was anything praeclarus ("excellent" or "noble") about it, nothing to justify our calling the cup Jesus used at the Last Supper a "precious chalice" – still less "this precious chalice" (hunc means "this"). So what is Dr Shaw claiming: that an uninspired prayer trumps the Word of God? My response (directed to the letter published in hard copy, though equally applicable to both). Margaret Smart (Letter, 15th October) unwittingly illustrates the point she wishes to deny. She clearly thinks that it was a mistake for St Jerome, and his predecessor translators of the gospels into Latin, to use the Latin 'calix' ('chalice') to translate the Greek 'poterion'. She further thinks it was a mistake for Pope St Gelasius I to allow the phrase 'praeclarem calicem' into the Roman Canon. Most interestingly of all, she thinks it was a mistake for Pope Paul VI to retain this phrase in the First Eucharistic Prayer, and allow 'calix' in the others. What she cannot claim is that the new Missal translation is mistaken in giving 'precious chalice' for 'praeclarem calicem'. That is simply what it means. So her objection, to repeat, is not to the translation, but to the Latin original. She, like many of your correspondants, is rejecting the theological aptness of the 1969 Mass, and of the entire Western liturgical tradition which lies behind it, in relation to this exact phrase. However, I fancy her objections are based on a misunderstanding. While the chalice may, or may not, have been precious in terms of human craftsmanship, it was certainly precious in terms of its contents. And as the Church accepts Tradition as a source of dogma alongside Scripture, the Roman Canon has its own theological authority. So here I am, once again defending Archbishop Bugninni and Pope Paul VI against the onslaughts of ignorant people who think they know better. And I shall always defend them in such cases. Insofar as they gave us innovations, what they did is fallible of human nature and can be criticised by Catholics of good will. But insofar as they faithfully passed on to future generations the ancient tradition of the Church, their actions have the authority of that tradition, in this case an unbroken Ordinary Magisterium of fifteen centuries. That authority does not give way to silly letters in The Tablet. Chalice: the Holy Chalice of Valencia, which has long been claimed to be the 'poterion' used at the Last Supper. 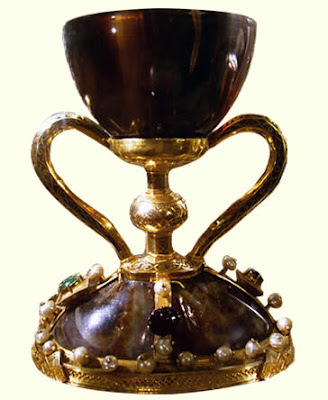 The cup part of it is indeed of Our Lord's era, and is made of agate. 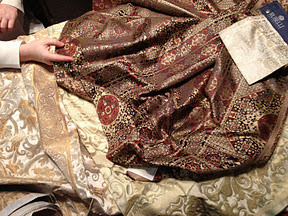 There is more information on Fr Z's blog. The first edition of the new-look Mass of Ages, produced by our new editor Gregory Murphy, is now available. It is on its way to LMS members, and can be purchased from a number of Catholic bookshops, as well as directly from us on-line. For the first time it is in FULL COLOUR! 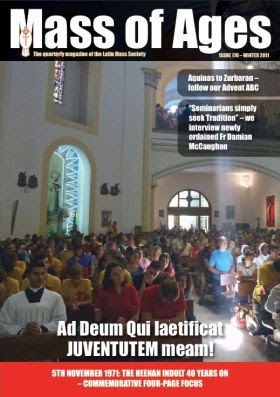 We have interviews and special features, news from around the country, a regular report from Rome, a new family notebook column, an Advent feature, a special appeal about Lourdes, an interview with an ex-LMS Rep turned priest, a feature on the 40th anniversary of the Heenan Indult, in-depth reports from WYD from a Traditionalist perspective, comment and opinion columns, a delve into the LMS archives from past decades, your letters and a prize crossword, plus full listings of Traditional Masses across England and Wales.